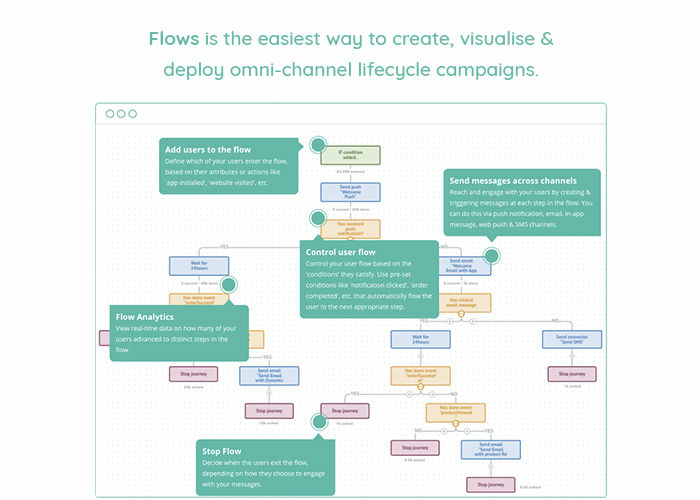 MoEngage is an intelligent marketing solution designed to help you create, visualized and deploy omni-channel lifecycle campaigns. The idea is to proactively engage users no matter which channel you are using and to build a marketing workflow that can help you define the customer journey as they are shopping with you. 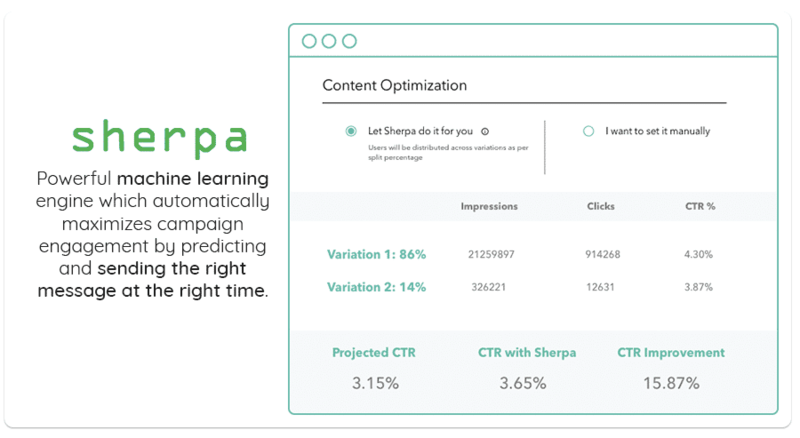 MoEngage has an AI AI algorithm, which can provide personalized recommendations to your customers to help you increase engagement and, ultimately, boost revenue. This enables you to engage with users in the channel of their choice at exactly the right time. 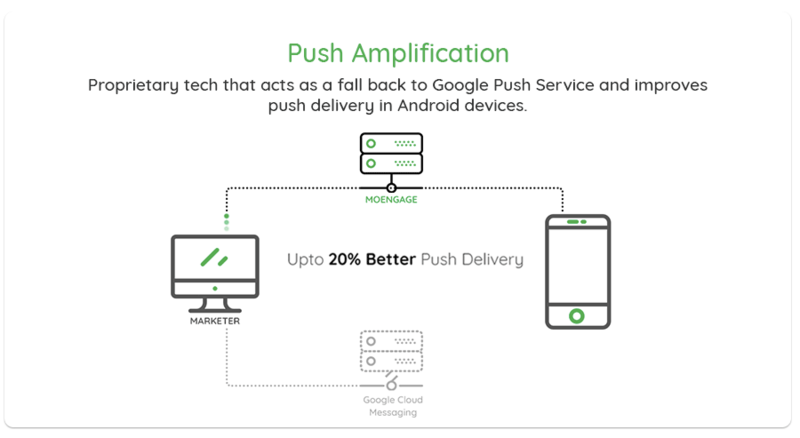 You can also send users dynamic push notifications, which can help drive sales conversions. These personalized push notifications help nudge users by reminding them of your product or service and bringing them back to your site or app. 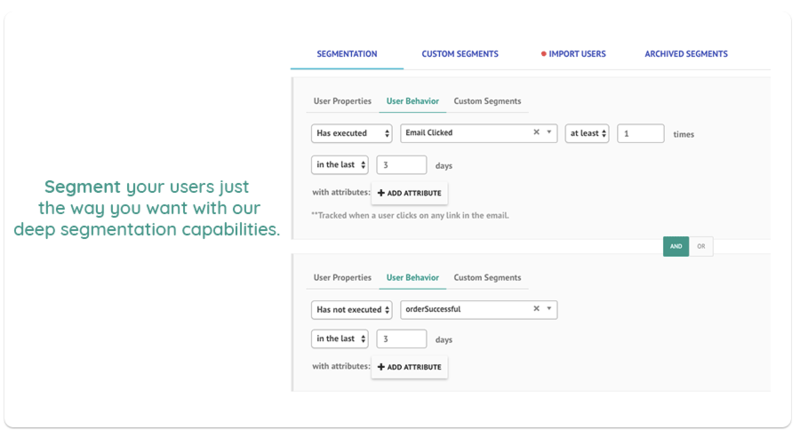 You can also create and deploy lifecycle email campaigns to help re-target and re engage users. How much does MoEngage cost ? MoEngage offers a Free Plan with limited features. They also offer an Enterprise Plan for their product. Disclaimer: The pricing details were last updated on 21/12/2018 from the vendor website and may be different from actual. Please confirm with the vendor website before purchasing. Moengage!!!! A story to be written in Future...For sure. Pros: Ease of doing is superb. It lets you do minimum and gain maximun. Cons: some functionality still need to be improved like you cant use AND/OR condition simultaneously while creating a campaign. Pros: The segmentation engine of Moengage is very powerful. It is easy to learn and design campaigns. The customer support team is also very helpful. Cons: Every MA platform has certain drawbacks and needs to be tailored as per your requirement. Moengage has done away with most of the limitations we faced with subsequent product releases. Cons: Delivery Rate can be better. Analytics can be better. Pros: Segmentation, Good Filters, catalog manage, Recent views are more informatic. Cons: Campaign template is not user friendly. Pls make it more user friendly. 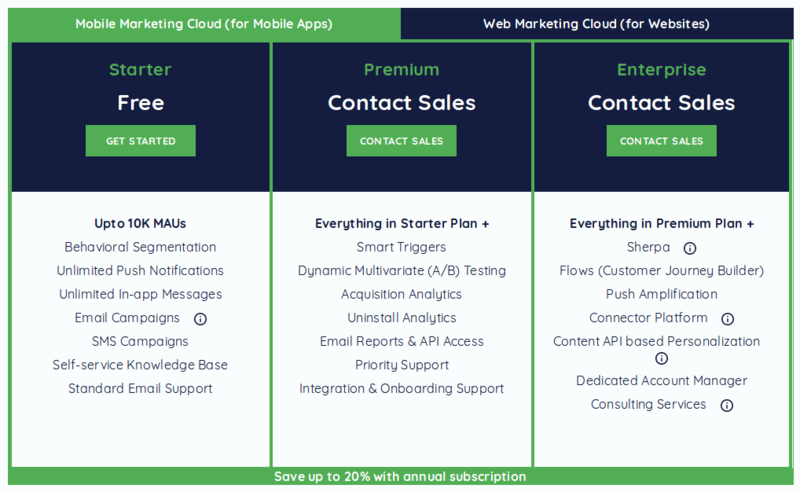 Pros: Many aspects - Reachability to various types of devices, support to all the platforms we need, basic Messaging and Analytics possibilities, A/B Test Messaging and many others. The team is awesome who diligently have been closing all the gaps we found in feature set. Their approach is very positive and the quality with time have been satisfactory. There are competitive products with more features, but MoEngage approach to start with MVP and pick up our priorities first, shows the commitment needed for long term relationship. Cons: Few parts of the usage needs basic product Engineering understanding which is often lacking in Marketing. The solution should abstract such flows such that the campaign definition to product mapping is agnostic to campaigner's engineering knowledge. Overall: We are using MoEngage as single messaging platform for all of our products, to fill the gap of reaching user contextually, on time and convert them into our loyal user base. 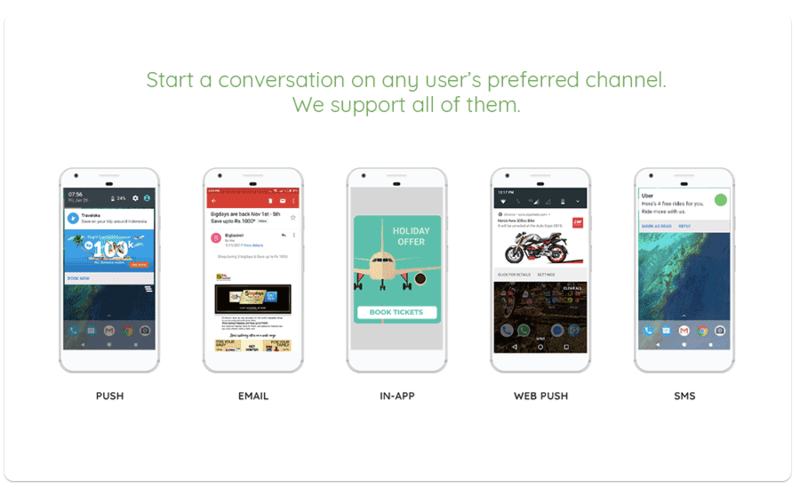 We have broad range of platforms and plan to experiment a lot around content, channel, etc to beat the indutry best of messaging. He have succeeded in the initial tests, got our benchmark and now want to go above and beyond in meeting our monetization and engagement goals. Overall: I'm very satisfied with the product. We see considerable improvements across our user funnel. Pros: Easy to use and highly configurable. Works on all platforms. Overall: Have been using for the past 2 years and lot of improvements . We use push and inapp notifications . This is very easy to use. Any new tema member can easily get started with it. Pros: Personalisation is key in digital marketing and the level of depth of the technical capabilities the Moengage platform offers has been critical in our cross-channel activities. Instead of BAU, one-size-fits-all approach, you can really dig down into granular segmentation and this has been catalyst to such impressive commercial successes in our first year. Cons: The tools are strong but the interface could use some development. It's not necessarily 'pretty' or too intuitive, and that's okay, because it works. But could use some improvements. Overall: We selected Moengage as the expertise they could provide in the digital sphere really drew us. Their product innovation is second to none - they aren't just players in notifications, they are thought leaders. Their support and knowledge they provide, from our client manager to the free webinars they provide to get the most of the tools, are second to none. We look forward to many more years working together and growing on the impressive results we've achieved to date. Pros: The custom delivery options that moengage has, enabled our team to personalise users and made our marketing omni channel. Cons: While infusing into the system, several requirements of analytics were missing from the product. With regular feedback with the team, we received them but it took months. Pros: I like the simplicity and people at Moengage, who do extra effort to help their customer to run a good campaign. Cons: There are few features missing which are needed like web engagement, analytics and optimisation, which though we have been promised to be shipped soon. Overall: Overall I am satisfied with the tool, if implemented correctly it helps deliver user engagement at a good cost. Few minor bugs and issues happen, but team acknowledge it and try to fix it.